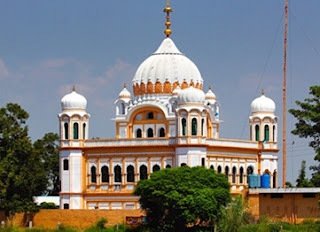 Today morning AAP supremo Arvind Kejriwal special went from Amritsar to border town Dera Baba Nanak to see the site of proposed Kartarpur Corridor and he had distant darshan the glimpse of Kartarpur sahib which is situated in Pakistan. Our friend the prominent AAP leader Gurinder Bajwa explained to Kejriwal about the movement for Kartarpur Corridor: how people are praying for 16 years for corridor; how Pakistan is willing to grant corridor, how the people of Punjab long for corridor opening and how Indian Govt has adopted cold attitude towards the demand. 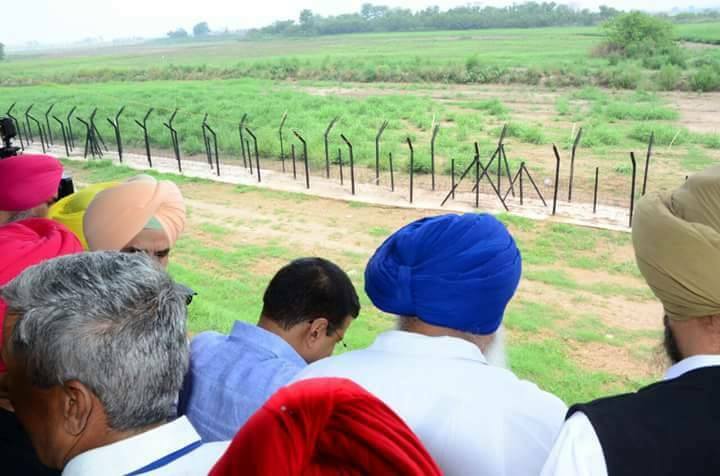 Security with Kejriwal didn't allow press the opportunity to ask Kejriwal's reaction to Corridor movement right on the border. 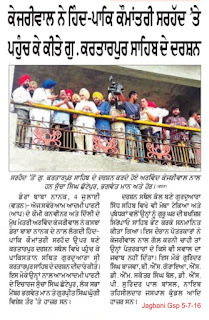 Since people like Gurinder Bajwa have say in AAP matter, it is hoped that AAP has a positive approach towards Corridor demand. On the Day 2 of his Punjab visit, AAP convener and Delhi CMArvind Kejriwal accused the ruling combine in the state of indulging in communal politics. 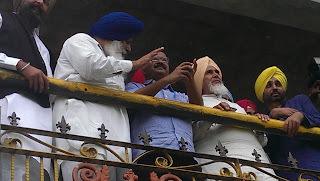 “Since AAP has emerged as a serious challenge to these communal forces (SAD-BJP), they are not keeping any stone unturned to defame the party (AAP),“ alleged Kejriwal while referring to the recent case of desecrating Quran in Malerkotla. 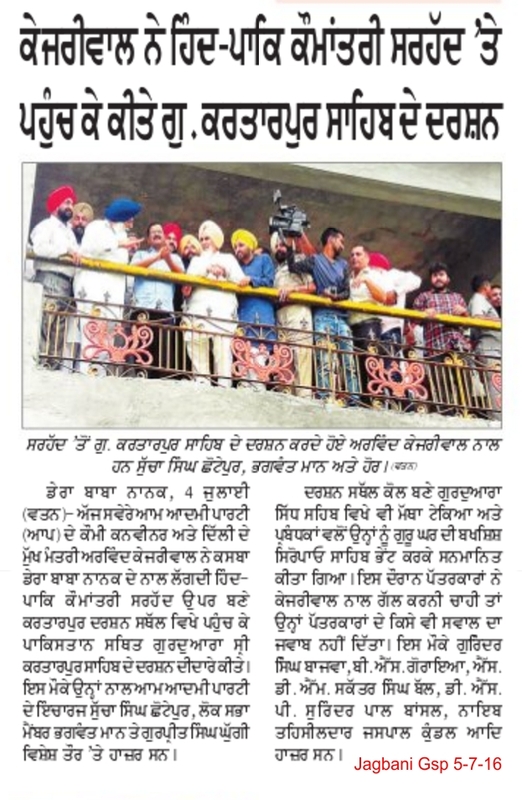 Kejriwal has termed it as a conspiracy to implicate his party MLA. 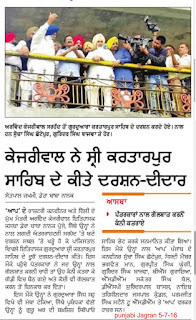 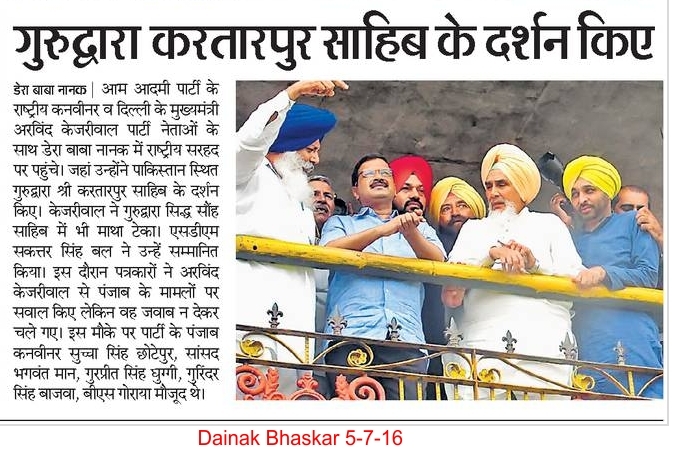 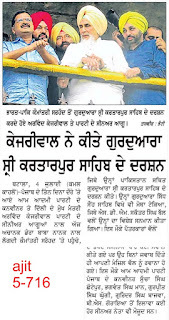 As in Amritsar, Kejriwal targetted Punjab cabinet minister Bikram Singh Majithia in Gurdaspur too. 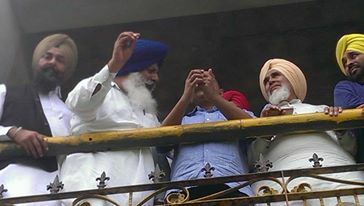 “I reiterate it again and again, that we will put Majithia behind bars, once voted to power,“ he said. 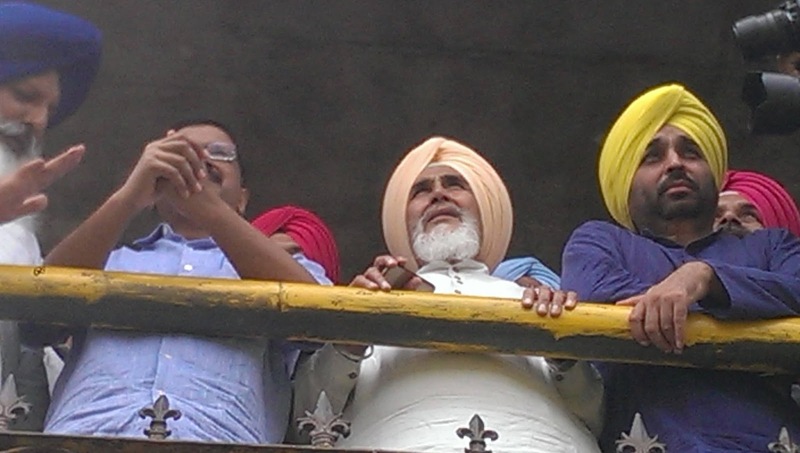 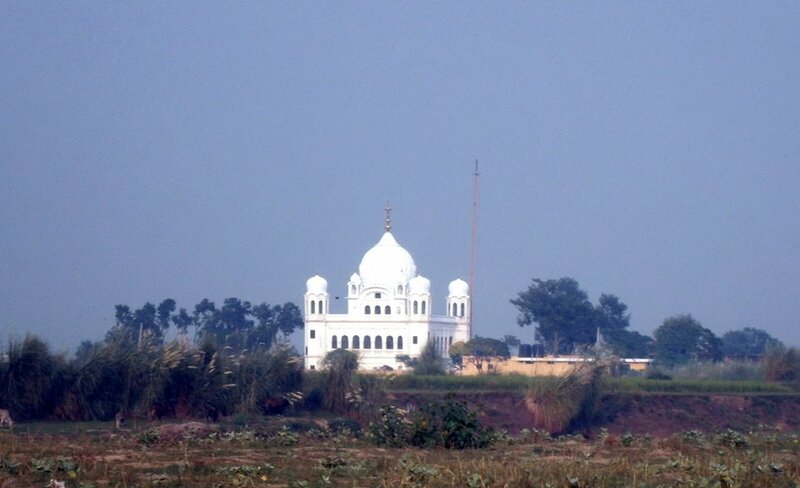 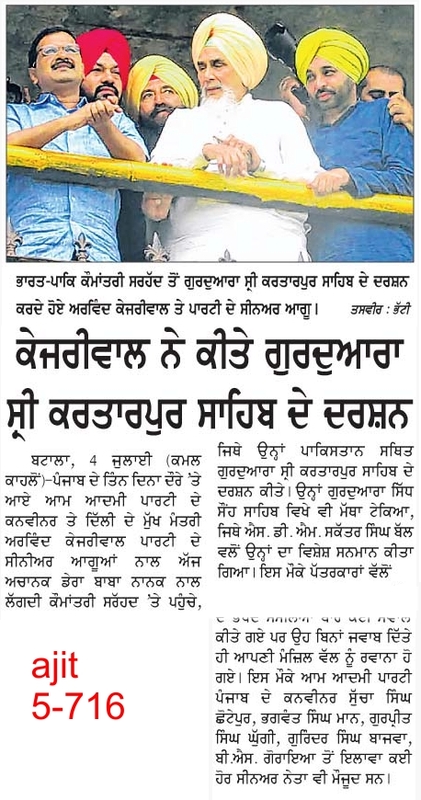 Earlier, while coming to Gurdaspur from Amritsar, Kejriwal paid obeisance to Gurdwara Kartarpur Sahib in Pakistan while viewing the shrine from Dera Baba Nanak.